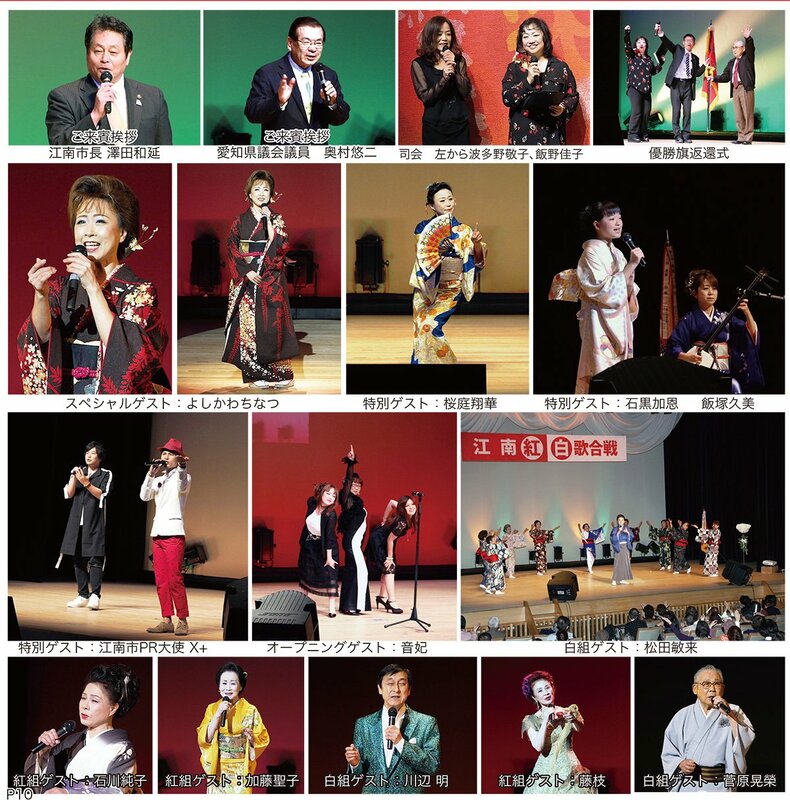 Charity The 4th Konan red and white singing fight, on November 23, special guest at the Konan civic cultural hall, special guests to the local Japanese dance artists: Sakuraba Shouka, local folk singer: Ishiguro Kaon, PR Ambassador of Konan X + (Ekusuto), held a grand prize to the opening guests inviting sounds. Konan red and white song fighting performed at the stunning player swear of local elementary school student Hounsard was crowded all day all over 700 people visited for viewing. As a result, 247 votes of the Red Group, 205 votes of the White group, and the Red Sword bloomed back to the victory for the first time in two tournaments. Yoshikawa Chinatsu special guests are fascinated by the mastery of singing skill. Sakuraba shouka held a superb class dance and left a brilliant impression. 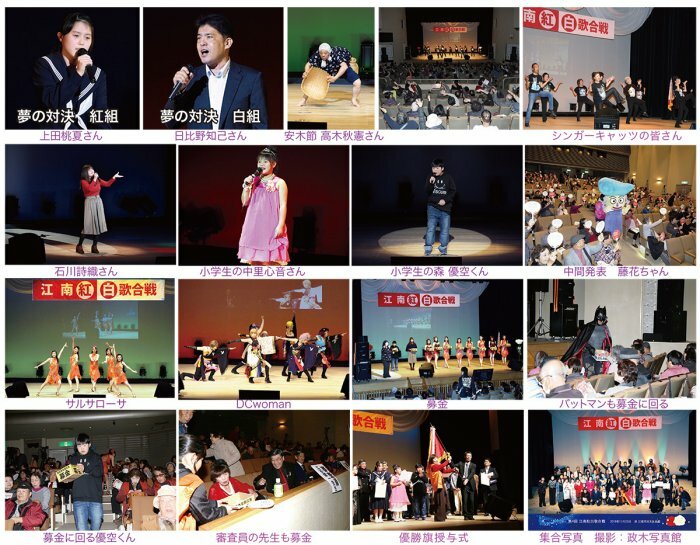 Ishiguro Kanon who is a junior high school first grader who have a victory by the Minister of Education Award at the folk song national competition at the time of 6th grade of Hotei elementary school was applauded. Konan-city PR ambassador X + sings a few songs, including Konan's image song "Fujio noren" they composed and composed. Opening guest's sound queen (Otohime) shows off a nice song "Tokyo one-night blues" giving dreams and hope. Guest Seiko Kato, Akira Kawabe, Fujieda and Koueii Sugawara also have their own songs. Ishikawa Junko and Toshiki Matsuda's battle confrontation is suitable for the stage that concludes Kohaku and excited the venue with outstanding singing skills. In the general appearance, the dream confrontation of Ms. Ueda Momoka of the local middle school second grader and Tomoki Hibino who shined all Japan Amateur champion attracted attention. Everyone expressing the singing singing voice shines vividly, the elementary school singing enthusiasm is even more fun and it was very cute. Sarusarousa and DCwoman 's dance, Karin Murakawa's back dance, Akinori Takagi 's Azuki clause (Dojyousukui dance) was magnificent and excited the venue greatly. Facilitators Ms. Keiko Iino and Ms. Keiko Hatano became big lubricants and successfully led the 4th Konan Kouhaku and Singing Fight. Mr. Takeshi Kondo and Mr. Kenichi Tsuchiya judged over a long period of time. Everyone who helped with volunteering, including those behind you, I would like to say thank you for taking this opportunity. As a charity song festival, we also donated 41,493 yen donations collected at the venue through the Japanese Red Cross Society in July, Heisei 30 as a heavy rain disaster donation. We donated 21,600 yen of profit to Konan city social welfare council. I would like to continue to devote himself to making the topic of one event in Konan and contributing to culture in the future.